Village Theme Party . As the new angle steps in it fill our heart with love, care and joy and we all are start celebrating the day as a birthday and most favorite and the special for one and the other family members. Village theme party planner. 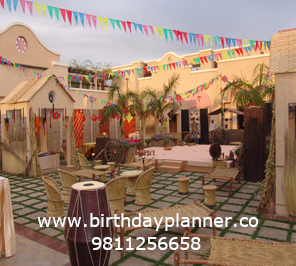 If we plan a birthday party on the village party theme party, the name itself shows the venue is outdoor and decorated like a village. Village Theme Party Delhi . Therefore the dress code is half lehnga choli for females and dhoti or payjama kurta for males. As the name suggest it belongs to the village, so arrangement of small pooja must be there, like cowki, or havan. Village Theme Party Ideas. So use of steel utensils in spite of glass crockery looks amazing. Food is accordingly plans sweets and khir can take place of ice creams. Jellies and preserved juices, soft drinks are replace with lassi and fresh fruit juices. As far as alcoholic drinks are concern use bhang and thandai. Village themed birthday party. First of all decoration of venue with cowboy figure, matkas, arificial trees and wells attracts the gathering and give original look to the event. Music is dhol, shehnai in place of dj other movie songs. 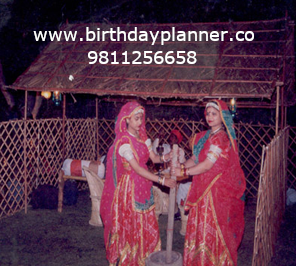 Village theme party planner. As the food the main attraction the variety of food but that too as per villagers makki ki roti, sarso ka saag, dal bhati chutrma, variety of dal , plain and jeera rice. Village Theme Party Decoration. Similarly tandoori roti and in sweets gulab jamun, burfi boondi and besan ke laddoo, milk and jalebi and even more items. Village theme party decoration. Hence arrangement of small dance program as garba or traditional dance enhance the grace of the event. A corner for the games like balloon shouting, dat game and the prizes for the winners. Village Theme Party Delhi. 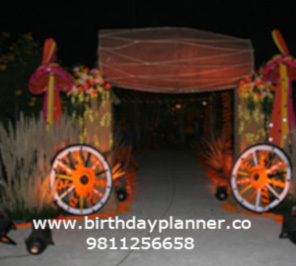 Similarly related theme Jungle theme party , Carnival theme party , Krishna theme party and even more.. Village Themed Birthday Party.